It's never too early to start planning for April's National Public Health Week celebration, so let's get started. 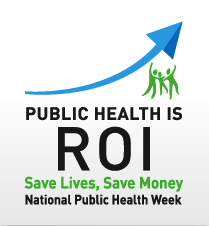 Announced by APHA's Dr. Georges Benjamin during yesterday's Opening Session, the 2013 National Public Health Week theme is "Public Health is ROI: Save Lives, Save Money." And there's no better time to celebrate and raise awareness about the importance of investing in a strong public health system than in these times of uncertain funding and declining resources. As the National Public Health Week 2013 brochure states, we are all examples of the public health return on investment. Consider this persuasive statistic: Investing just $10 per person each year in proven, community-based public health efforts could save the country more than $16 billion within five years! Talk about a serious return on investment. So, visit the official National Public Health Week website to learn more, download the brochure and sign up for email updates. Or stop by the National Public Health Week booth, #2332, at the Public Health Expo. It's time to shout from the rooftops that we support public health!